How Runners Rock a Thursday Night | Run, Lindsay, Run! My idea of a rockin’ Thursday night: doing a speedy 6.5 mile tempo run, showing up sweaty post-run to a fellow runner’s fundraising event, and eating 16 Handles for dinner. Seriously, I’m a total runnerd and loved every second of last night. I managed to escape work around 6:15 to drop my stuff off at the gym before running my warmup to Central Park for a CPTC workout. I was actually excited about this workout, as we’re starting to do some more marathon-specific training now that Club Champs is over. The longer (and slower! ), the better. The workout on tap: 6.5 miles— 3.25 out at Marathon Pace, straight into 3.25 back at Half-Marathon pace (or ~15 sec/mile faster). 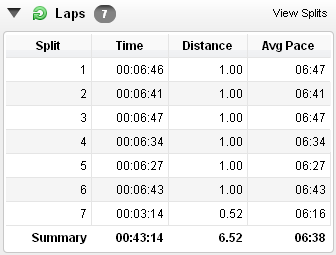 I wanted to start out around 6:50-6:55 pace, but our group kinda got caught up with the pace and averaged 6:45. Felt comfortable, definitely could have cruised at 6:45 for a while. We turned around at the 3.25 mile mark in 22:05, and started to drop the pace. I felt great and relaxed at first, but the rolling hills on the west side really killed me on mile 6. Nonetheless, I was still able to bring back down the pace, making the 3.25 return 21:09, averaging 6:30 pace. Last time I did this exact workout (May 5th, how’s that for a Cinco de Mayo celebration? ), my overall time was 44:04 with a 6:45 average pace. Progress! Directly after the workout (no changing, no showering, no nothing!) Megan, Alex, Rebecca and I headed over to Jackrabbit Sports on the UES for Ali’s awesome fundraising event. Even though we were sweaty (sorry!) Ali greeted us with a smile and hug. No judgements. Especially since I didn’t feel too out of place in my post-run glory because of these awesome shirts. They were only $25, are lightweight and soft, and benefit Ali’s support of the Crohn’s & Colitis Foundation of America. On September 24th, she’ll be running the Hampton’s Marathon in support of the charity and is going to rock. I spy some lovely runners and bloggers! Seriously, it was such a fun event though I’m bummed we didn’t arrive until 8:30. It was great meeting a bunch of new people, and seeing some familiar faces. I am always amazed at the running community here in NYC, and I never expected blogging would lead to some new friendships. Hooray! After the event, my co-worker (and fellow runner!) Jamie and I headed over to 16 Handles on the UES. I hadn’t had a real dinner (though the mini sandwiches, fruit and brownies at the event were delish!) but figured I was too close to pass up my favorite froyo. The line was just about out the door! Shamelessly, mine may have cost almost $9…I blame it on the gummy bears. Jamie and I sat outside and ate our froyo while talking about running, dating, work, and life. We both joked about how this was our idea of a good time for a Thursday night as we saw people going out for the night to bars, and it was true. On my way home, I couldn’t stop thinking about how much fun I had. I was in my element, getting in a great road workout, meeting new running friends, and eating 16 Handles. I just felt like myself. Everything about tonight was totally me, and I was happy. You know those moments? They’re hard to describe, but awesome when you find yourself in the midst of them. SIDENOTE: I’m planning to do a post for my upcoming race schedule, but I am officially registered for the Big Sur Marathon in 2012. No matter what, I am not racing this race- running it solely for the experience and scenery so I enjoy it. The race is 91% full, about to sell out, so if you’re on the fence, or want to do a fun destination marathon- sign up now! I’d love some company. If you need more convincing, check out these awesome recaps by Susan, Page and Aron. Seriously, try tell me you don’t want to run that next April. That’s what I thought. So, want to run Big Sur? 🙂 What was the most exciting thing you did this week? When was the last time you were really happy and content doing something? Simply hanging out with friends? Swimming in the ocean? Relaxing and reading a great book? Cooking a new recipe? Tell me about the last time you really felt ‘in your element’! I know you know those moments I’m talking about. Blast! I want one of those shirt!!! Love it. I’m new to distance running – it’s only been about six months – and I’ve only done two 10ks so far. It really is SUCH a good time, though, isn’t it? It’s meditation, foot pounding joy, and the total embodiment of “life without limits”. Enjoy Big Sur! Whoa! Sweet tempo run! That’s awesome and you should feel so stoked when comparing it to your May one! I was at Ali’s event, too, but then had to leave to meet some friends for dinner (friends I’ve known since the 4th grade – crazy). I would do Big Sur, but I haven’t decided on a spring marathon, yet! Gonna wait and see how NYC goes and then decide if a) to do another and b) which one. I kinda want to do the Eugene (OR) one. Hmm – when I’m most content – at home with my family, in our kitchen or out on the tennis court – thats when I feel most at peace. Whenever I go back and play tennis, I always feel like tennis is “my” thing whereas running is so new to me, I still feel like a poser or like its not really “mine.” I’m sure this makes no sense. ha! So, I have been debating Big Sur for my spring marathon. I’m so indecisive though! And nervous about getting there since I don’t really drive… and it’s not close to an airport? That sounds so lame. What’s your plan?? You should do Big Sur!! 🙂 I am a bit lucky in that my sister is in her last year of college in San Francisco (and my Aunt/Uncle live in a suburb outside), so I am planning to fly out and stay there a bit before the race, and then drive with them down closer to the race. I’m sure she wouldn’t mind an extra person crashing! Big Sur!!! Ahhh!!!! I was getting ready to run it one of the first times I met you. 🙂 Best marathon everrrrr. Although you might have a chance at winning if you run fast, definitely soak it all in. (Actually, even if you take it easy you’ll still be up near the front…) Beautiful race, well run…..loved it! I’m such a runnerd like you, last night was so awesome! I’m not a huge bar person (am I old if I say they’re so loud?? ), and it was so fun to see everyone last night since we all had running/blogging/twitter/some combo of those three in common. I love our little runner community. I definitely have the same feelings as you about feeling like it was a “me” type of evening! I remember back in college when I truly felt in my element…most people think I’m a really quiet person, but if I’m around my friends and comfortable, I’m quite chatty and much different than the quiet little Susan most people think I am. Being surrounded by huge groups of marching band friends (I was cool in college too…), I could let go and totally be myself…miss those days! Definitely getting there with our sweat squad, however! All of you are making me want to move to NYC. Seriously – what you just described is my ideal night. I’d rather get in a great workout and hang out with other runners after than go “out” in the typical sense of the word. Maybe I’m old and crotchety…or maybe I’m just obsessed with running (probably both, haha). And it’s so exciting that you’re doing Big Sur!! I am *this* close to registering. I know I should stop waffling back and forth but I just don’t know… I’m definitely doing Boston this year, and I’ve never done two marathons that close together – so if I did, I’d probably want to complete the B2B challenge (all for the “honor” of spending extra money for the registration fee). I know I could sign up now and then be refunded if I get into B2B in Sept but there’s something holding me back. Maybe I’m a wimp. Anyway, glad you had a great night AND an awesome workout – you are super speedy!! Sounds like an awesome Thursday night to me 🙂 I am a total “runnerd” too! Awesome workout – and so cool that you improved so much since the last time you did that one. I love being able to see my own progress like that. Yay for registering for Big Sur!!! I would love to be able to run that marathon someday. Big Sur sounds awesome. I wish I didn’t have to make my decision so soon!!! totally hear you on doing oddball things with like-minded people that just feel so right and totally you. welcome to my life! glad you see things through that lens… it’s somehow empowering, no? I’m running Big Sur next year:) I plan to run with my camera and take it all in. After my last trip out west, it made the decision easy to sign up for this! Weekend Recap: Summer Streets & Running ‘Naked’ « Run, Lindsay, Run! Mid-Week Long Runs & Soft Serve Fruit « Run, Lindsay, Run!